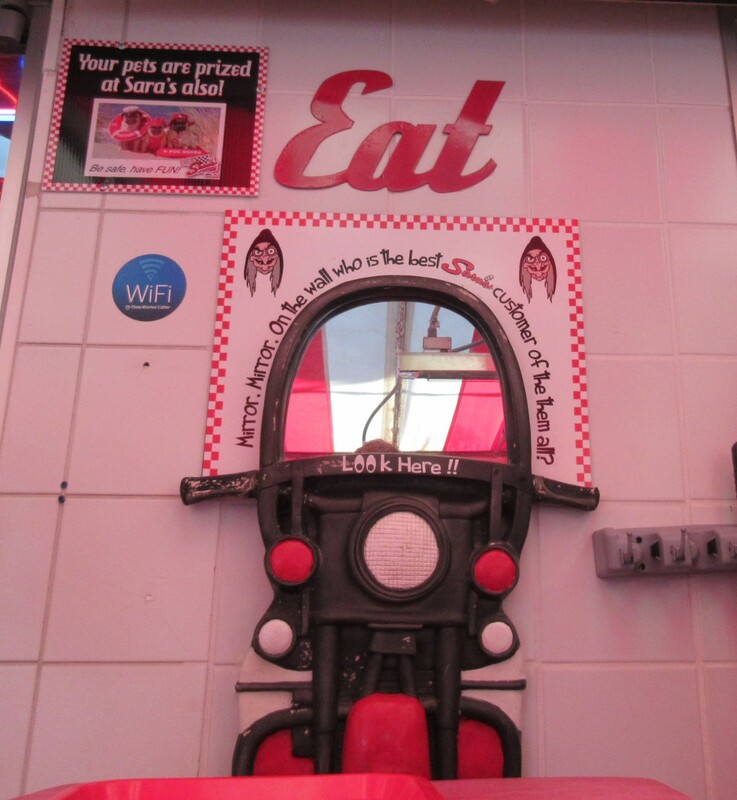 Our 2018 Road Trip, Part 3: Mealtimes with Sara and Chud « Midlife Crisis Crossover! I was starving by the time we wrapped up our afternoon with Rutherford Hayes. A short consultation with Google Maps brought up a few local establishments. One spoke to me more than the other, and more importantly was just a mile up the road. That’s how we found ourselves at Chud’s Grille. No relation to the movie. At all. Sadly. 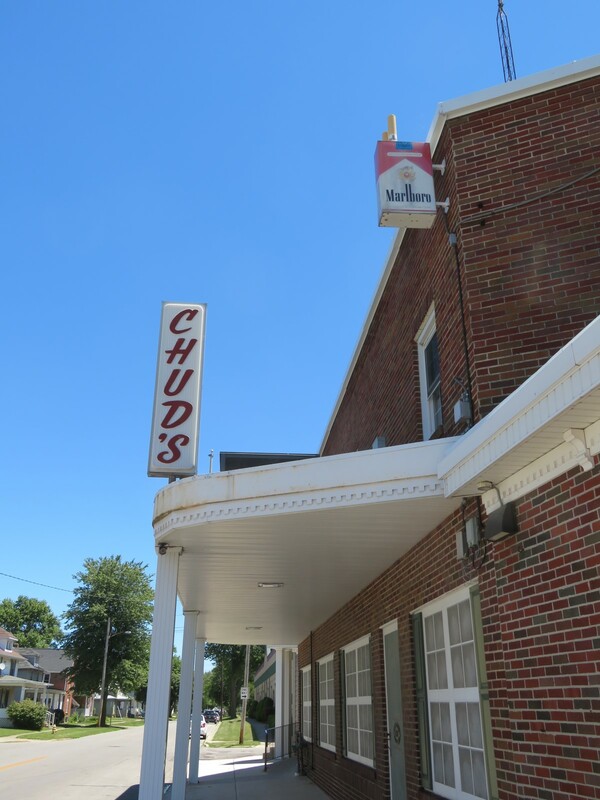 Chud’s owes its existence and endurance to founder A. A. Chudzinski, who started serving the Fremont community with a grocery store in 1924. His son Daniel, who served as an Air Force gunner in World War II, took over in 1963. He in turn passed it on to his children decades later, by which time they’d also acquired the restaurant space in the same building. Today the building lives on with its Cheers-like restaurant/bar and a small convenience store. 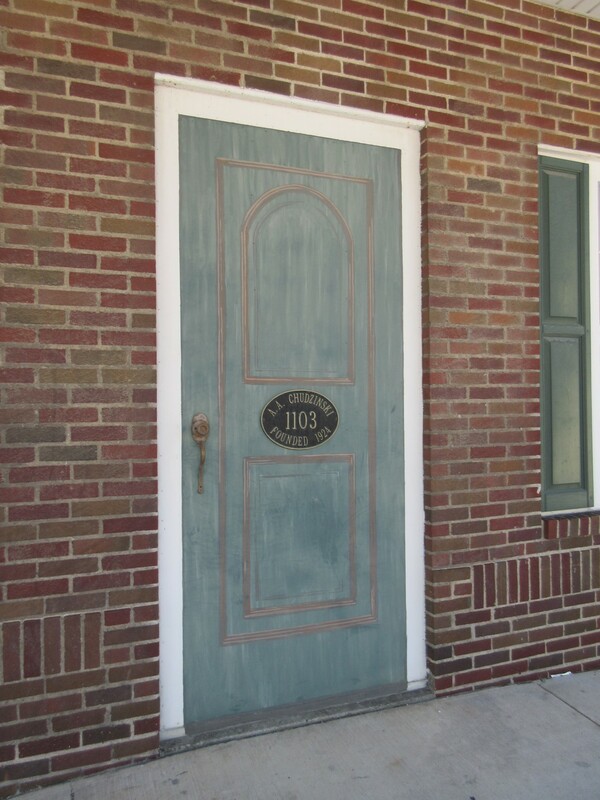 Fake door as archaeological evidence. By 2 p.m. the place was nearly deserted, but the staff didn’t look at us funny. 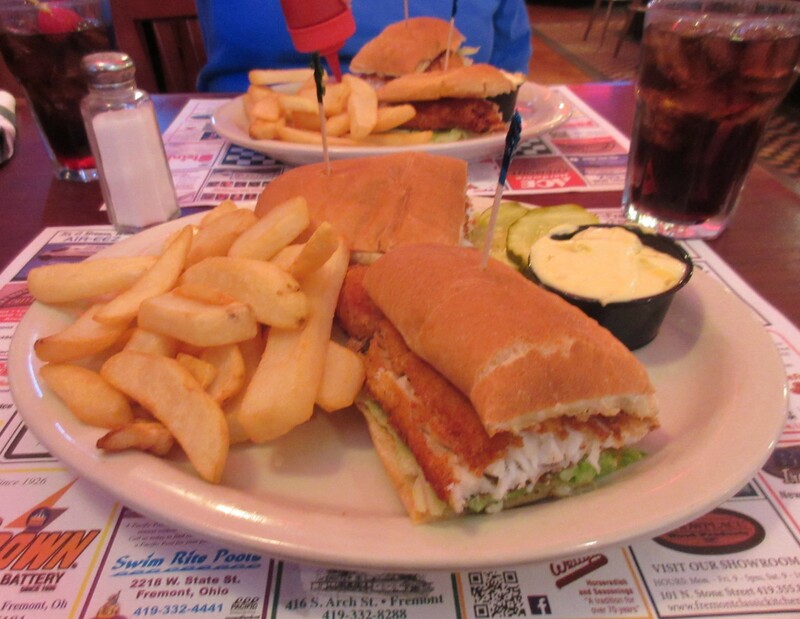 Anne and I both ordered sandwiches of Lake Erie perch and enjoyed some time away from the road. Good fried fish. Doing business in a state next to a Great Lake is definitely an advantage. Our next objective was to move beyond Ohio, heading northeast to and through Cleveland. We previously visited a few of their highlights in 2013, but didn’t have time for an encore just yet. Regrettably, we can’t stop in every single place we drive through. 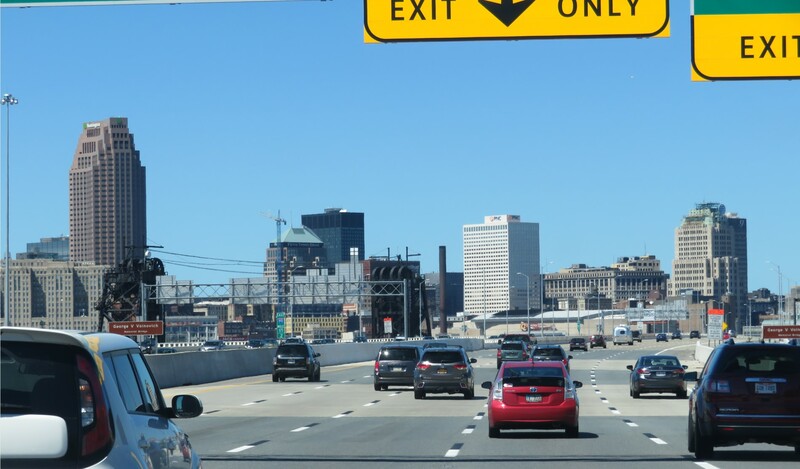 Cleveland gets used as a frequent punchline, but it’s done us no harm, setting aside the time our car broke down there, which wasn’t their fault. Quite the opposite, Cleveland had saved us that day. Saturday afternoon downtown traffic, blessedly light. Progressive Field. 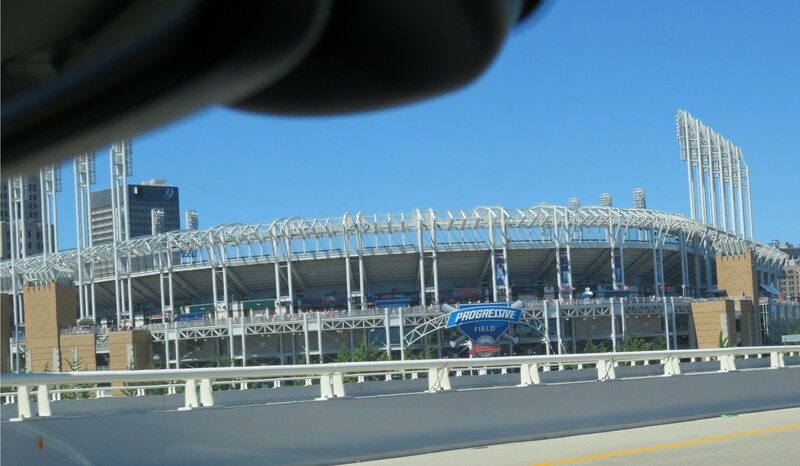 home of the Cleveland Indians, who this year will be marking the 70th anniversary of their last World Series victory. Two hours after Fremont, beyond Cleveland came a series of familiar sights, including but not limited to the Pennsylvania border. 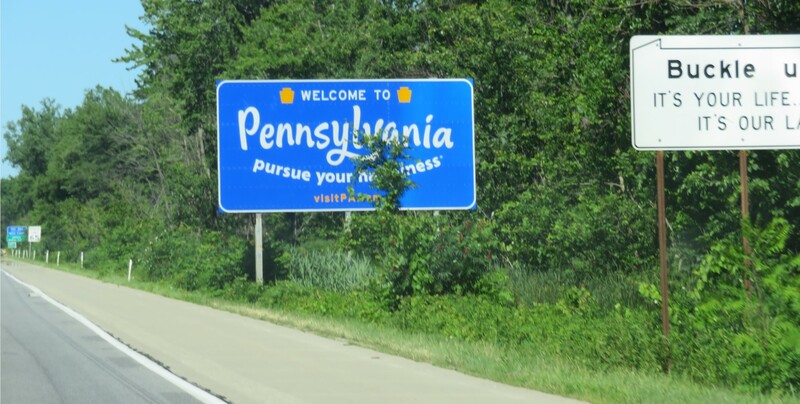 The Keystone State offers a moment of Travel Match Game in which drivers can have fun filling in the blank: “PURSUE YOUR _______NESS”. 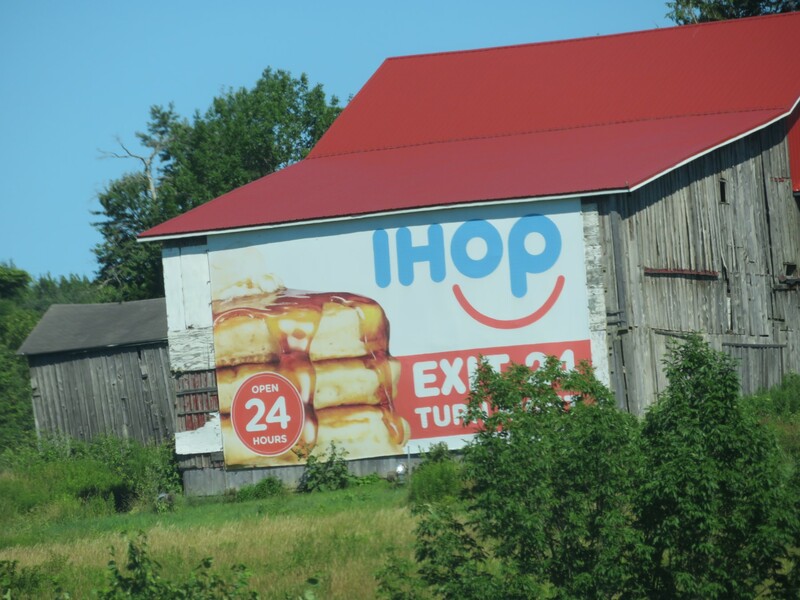 Roadside ads trying and failing to plant dinner ideas in our heads. At least they weren’t plugging that silly burger promotion. We checked into our hotel in Erie, across the street from a shopping mall and next door to other hotels, which at first made it confusing to discern which one was ours. For some reason we found ourselves assigned to a first-floor room across from the pool with an ADA-compliant shower designed for elderly guests reliant on caregivers. This has happened to us once before, though we can’t remember where or when. I expressed my sincere concern about taking away facilities from others who might need them. The clerk assured me they’d received no such reservation requests, and more to the point couldn’t swap us for another room anyway because they were fully booked for the night. They were not our favorite hotel of the week. Decompression soon gave way to restlessness. Dinner would be at a diner called Sara’s, recommended to us by an acquaintance of Anne’s. It’s the sort of hot spot where tourists go home and tell everyone they know, “If you’re ever in Erie, you have to eat at Sara’s.” And so we complied. Our quarry in the distance. Parking was minimal and awkward. A teenager directed traffic in the lot, triaging arrivals as needed into the drive-thru lane and sending the rest of us off to fend for whatever bare square feet we could find. We ended up next to a van with a flat tire behind some nearby pizza joint. Sara’s probably never has any quiet moments. They’re on the only road that leads to scenic Presque Isle State Park, in front of a major campground, and within walking distance of an amusement park called Waldameer Water World. On summer Saturday nights, the entire population of Erie relocates to the area and finds plenty to do. 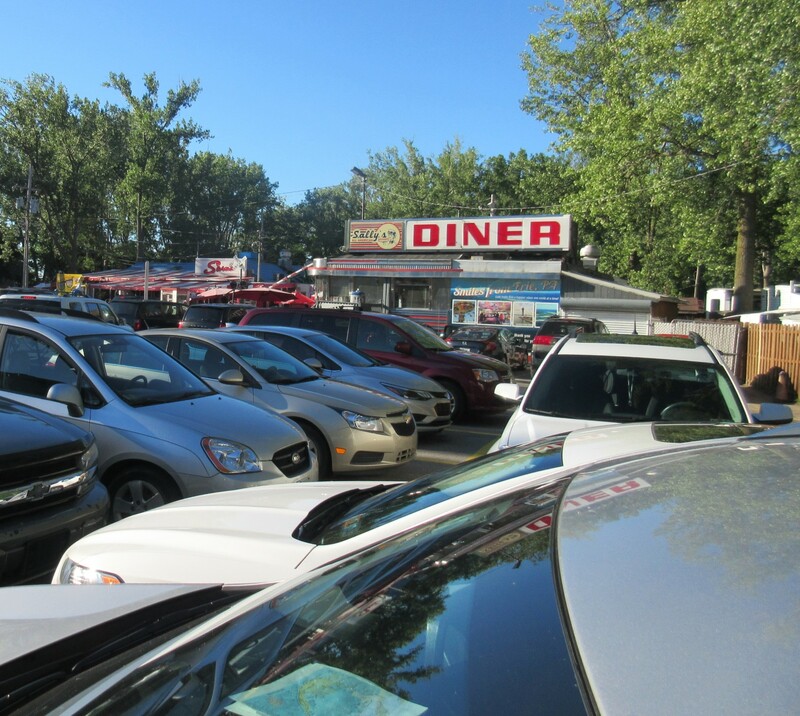 Most of them start with the diner fare at Sara’s. While they wait for their grub, they’re surrounded on all sides by bright neon and strenuously wacky decor inside and out. 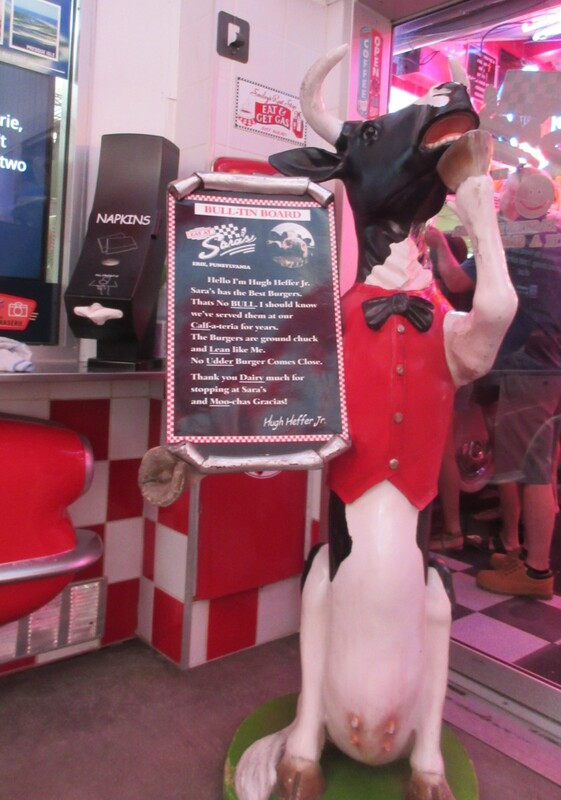 A “Hugh Heffer” making with so many cow puns, I suspect he’s a former Chik-Fil-A mascot gone rogue. You must be eight feet tall to see yourself in this mirror. Seriously, I took this photo with my arm stretched upward and no way to see the camera screen. 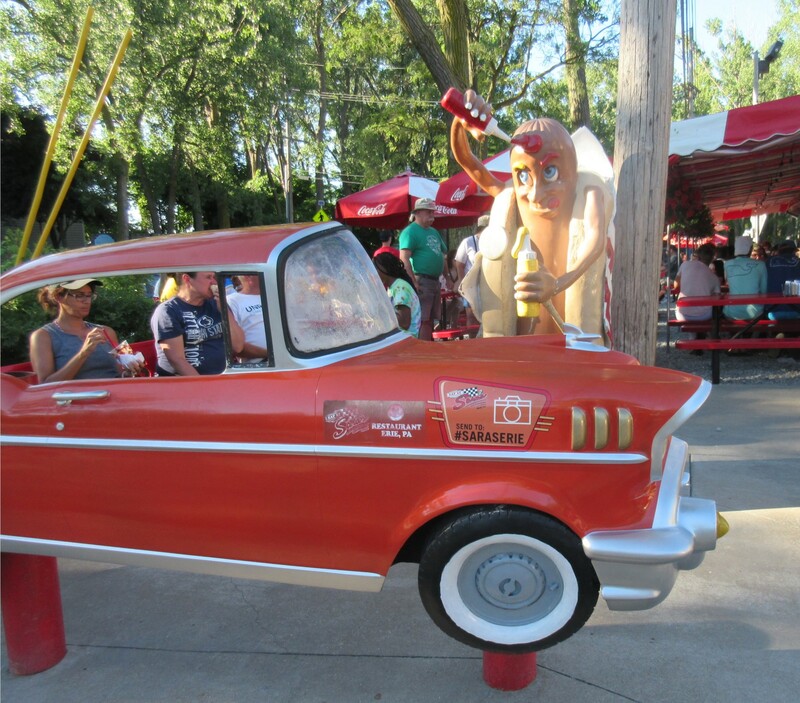 A hitchhiking hot dog tries luring a ride using the prospect of self-mutilation. 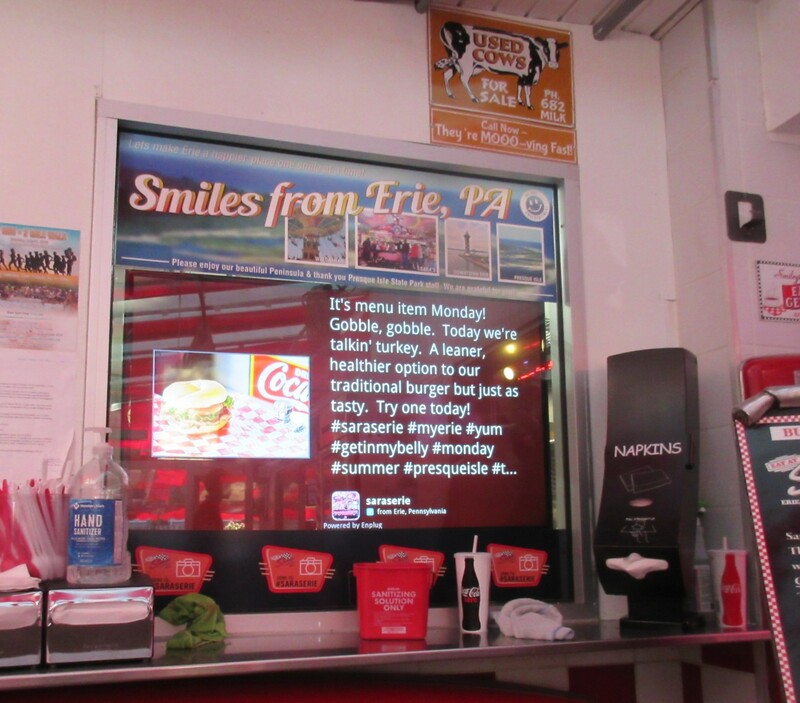 A wall monitor displays Instagram photos sporting Sara’s official hashtag. 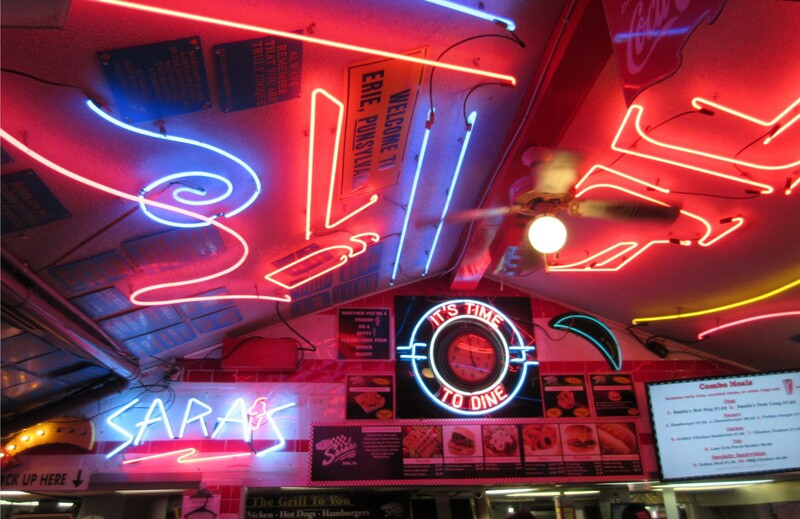 Sara’s has been around since 1980. 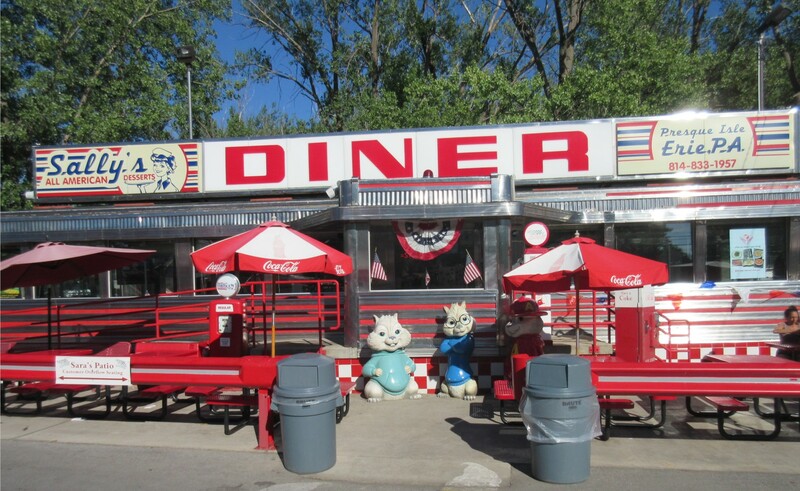 A few feet across the lot stands a diner that was built in 1957, did business under two former names in two previous Pennsylvania towns, and was bought and relocated to the grounds of Sara’s in 2003. It’s confusingly labeled Sally’s instead of Sara’s. If I’m reconciling two different essays from their site correctly, Sara is the real name of the owner’s mom, but Sally is her nickname. Or maybe he has two moms. Either way, Sally’s is no longer a separate entity but an extension of Sara’s, offering additional seating and a merchandise shop. Also, a glimpse of true stainless steel Americana. COMPUTER, ENHANCE IMAGE. 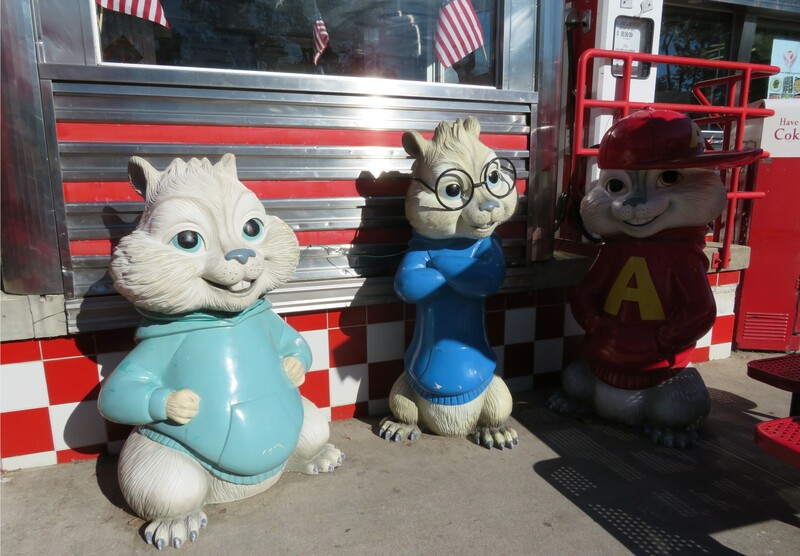 Yep, they’re the Chipmunks. 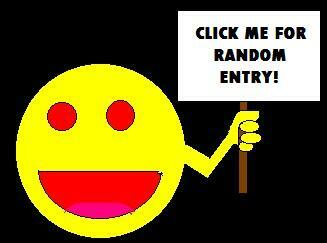 Because why not. I tried the Italian beef sandwich, which was flavorful and sloppy. 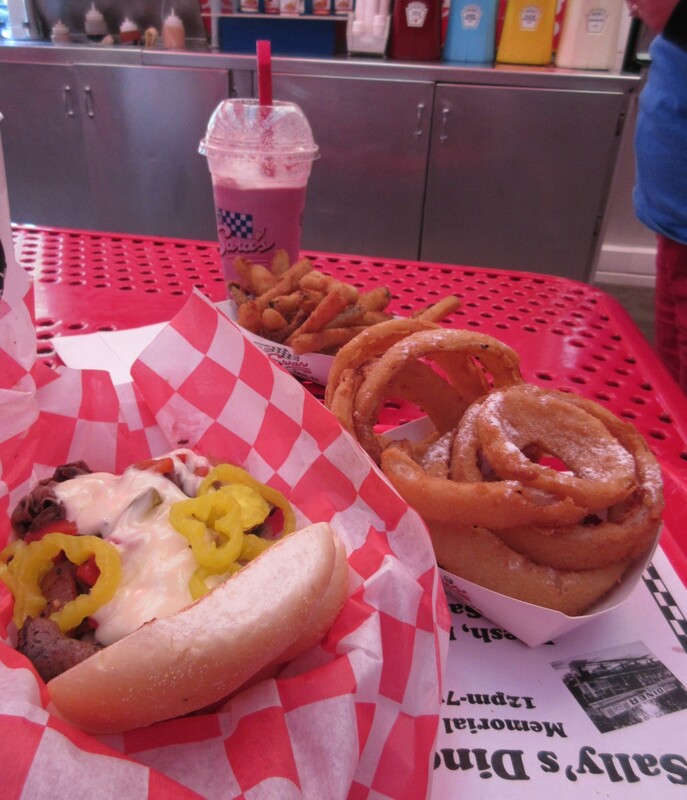 Anne had a basic hot dog and roughly three pounds of fried zucchini. Dining room amenities include Coke Freestyle machines and a condiment station with nearly two dozen spices and sauces to choose from as your sandwich toppings. In addition to the usual ketchup, mustard, salt, pepper, and so on, customers can also enhance their meals with basil pesto, roasted garlic sauce, a variety of rubs, spicy ketchup, and spicy Ranch dressing, which to me seems like the exact opposite of what the average Ranch lover wants. I’m not among them, so I won’t pretend to understand their psychology. Sara’s also boasts eleven shake flavors. Pictured: black raspberry for Anne. 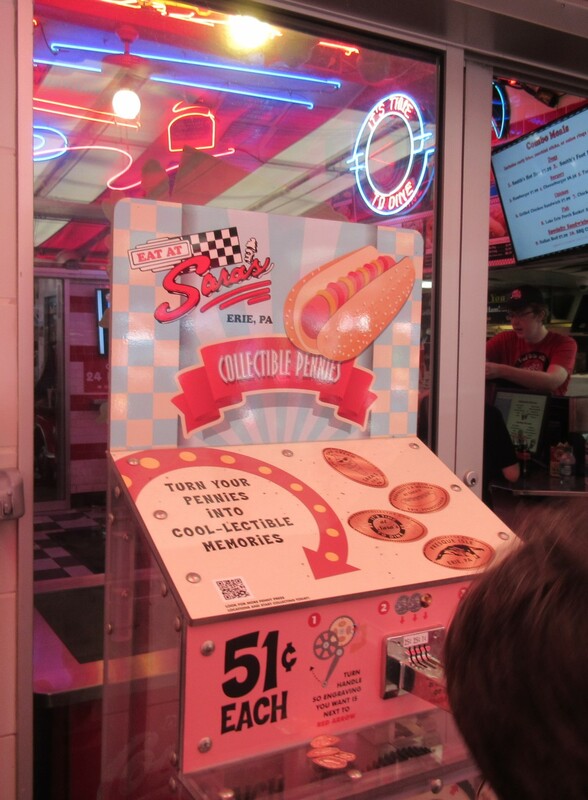 In addition to food, they had a smashed penny machine. Longtime MCC readers know Anne brakes for these as her souvenir of choice. This means Sara’s is officially a Good Place. 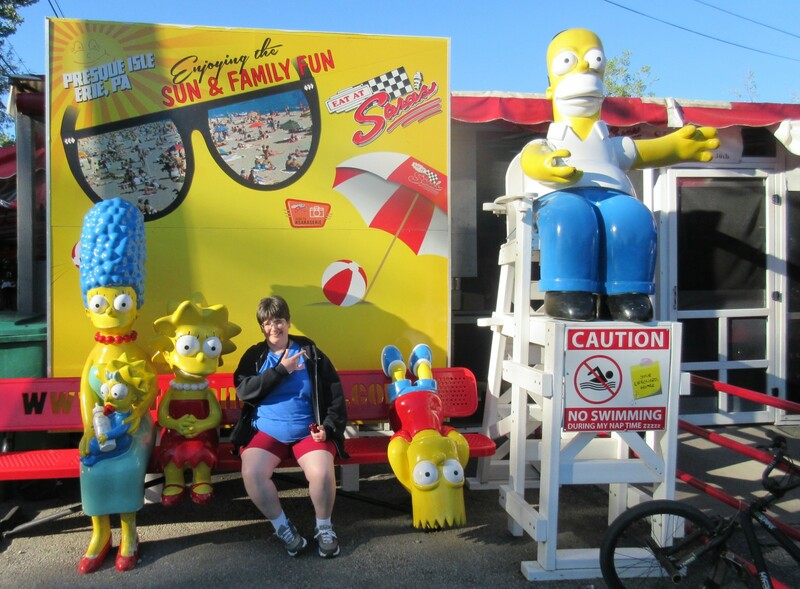 On our way out, Anne also appreciated the opportunity to engage in a moment of old-time Simpsons fandom. Sometimes wacky decor has its uses. Really, we’re pretty cool with any Simpsons-related moments as long as they don’t require us to watch new episodes. Some forms of Americana age less gracefully than others.